I spent $50 on lumber and hexwire to raise the height of the chicken yard. 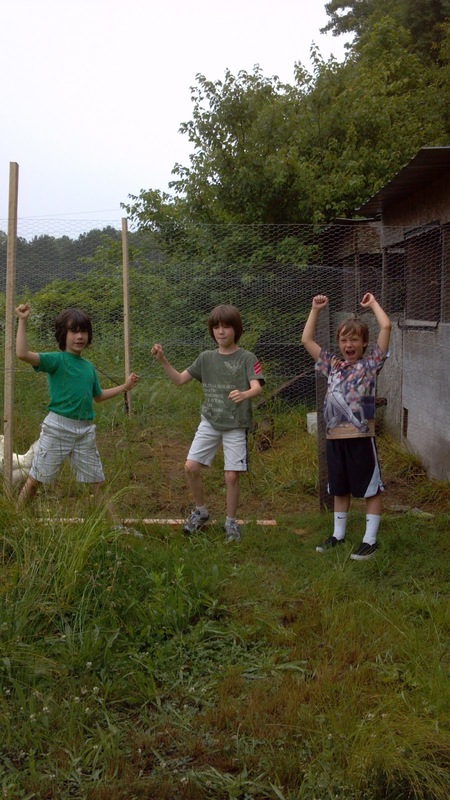 The kids dubbed the new plan "Chickencatraz." I tried to calculate if the money in the checking account would cover the supplies. It was raining and there were mosquitoes. We hadn't eaten breakfast yet. Their friend showed up to "help." One eight-year-old and two nine-year-olds were my "help." They dubbed themselves the "Chicken Busters." The project didn't take long. We did a half-baked job of setting the 2x4 lumber posts - eight feet long and only six inches into the mud. I snapped at everyone for things kids don't know, like swing the hammer hard without holding it by the head. They plotted and chased down the recalcitrant chickens. They decided they needed teamwork and strategy. I threw the caught chickens over the high fence. The boys cheered. When the neighbor said the Chicken Busters were cute, they corrected her: They are cool. In the car on the way to breakfast the boys insisted they heard the chickens say, "We gotta break outta this rock." Look closely and remember, we were all there at the same time, building the same chicken pen. My Point Of View: Stupid chickens costing me money and making me work in the rain and get bit by bugs. The "Chicken Busters" worked together to outsmart and capture the offenders. The chickens were airlifted into their new prison: Chickencatraz. The hardened chicken convicts are already planning their next escape. The boys are looking forward to doing it again. Your life experience is not based on the events of your life. Your life experience depends on your Attitude.